After years of offering satellite imagery as part of their standalone app Google Earth, last week the company added browser-based 3D perspectives to their popular Google Maps pages. No more downloading and installing an OS-dependent application: Earth View offers the ability to view mountains (and those thin blue lines flowing down them) from just about any perspective. Earth View also allows you to dive beneath the ocean’s surface and view shipwrecks such as the Titanic — or that sunken island off the North Carolina coast where the giant bonito shoal up. 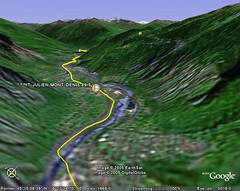 Get the plugin here: Google Earth Plugin, just open up maps.google.com and click on “Earth” in the tabs at top right.